We made it to the new year. Mum went bed early, even earlier than she normally does. 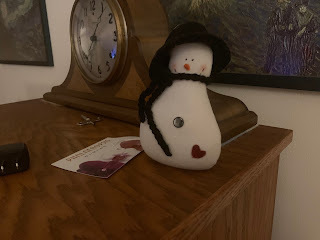 We got a bit of snow, so mum put the Christmouse stuff away and got out one of her little snow people instead. Just one since we are having a not so snowy winter. We watched the rosy purrade and then mum watched a bit of the hockey game. 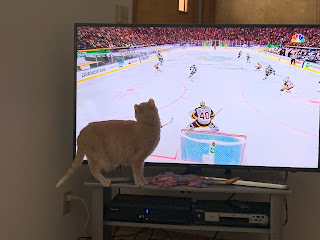 I got close to paw at the puck flying around. Today's throw back shows Derby having an rather unusual snack! My momma watched da Rose Pawrade too. Some new friends of my human's live RIGHT on the Rose Parade route! She may join them next year. I have a few snowpeople set out at the office; it's nice and festive. We just snuggled with Mom on the couch most of the day, watching a The Office marathon on TV. It was too cold to do anything else. Derby got to taste a rose? That sounds yummy to us! Looks like Derby enjoyed nibbling the rose. Good to see you getting right into that ice hockey game, Ducky. My mum also watched the Rose Parade and that hockey game. But she did it at her sister's house where she had spent the night New Year's Eve and left me all alone. Boohoohoo! Actually, we all went to bed about 10 pm here. Sometimes we stay up, sometimes we don't. Nice flashback, though. What does a rose petal taste like? Should we want some?